The HJ Alexander before- and after-school program received a second yellow card from Toronto Public Health on December 18. The school has now received two warnings for not providing a hand-washing sink for employees. 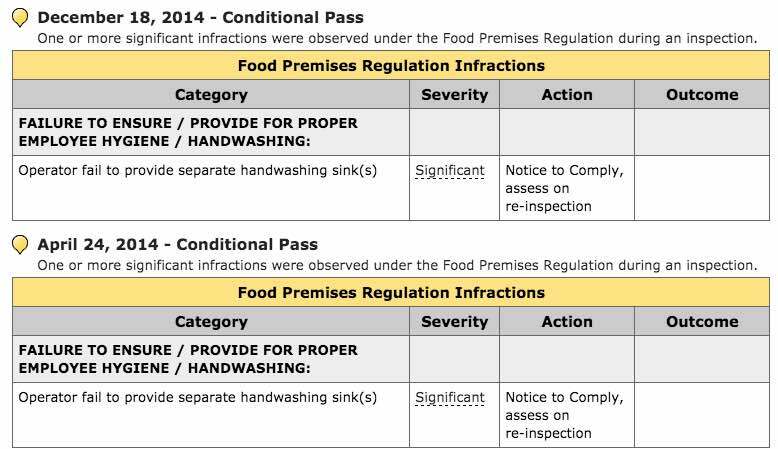 Conditional passes (yellow cards) are quite uncommon, and are only issued for significant infractions. Toronto Public Health says that the infractions must be corrected immediately, and that the location will be reinspected within 48 hours. That does not appear to have happened at HJ Alexander. HJ Alexander also received a conditional pass last April. Your humble correspondent has put in a few calls to see why the reinspections did not happen. I will update you when I find out. Previous Previous post: A cracking year!